The purpose of this blog is to share with you, dearly readers, what (or who) inspires me, and Charley Harper‘s two-dimensional style illustrations definitely do. During a house moving, while rummaging through some ‘bric-a-brac’ stuff, I found an old magazine I kept only because an illustration of Charley Harper. It was a ladybug and it’s engraved in my memory forever. In my youth, I used to be up before daybreak to observe nature, I have always been impressed by the beauty and the complexity of wildlife surrounding us. But Charley Harper had a unique view of the natural world and could capture the essence of his subjects with the fewest possible visual elements, depicting animals, insects and nature (although the majority of his work was of birds) in a style he called ‘minimal realism’. Design, colors, symmetry/asymmetry, precision; everything is in the picture, with many details but the whole painting seems so flat, so colorful, so joyful; a second viewing is often needed to get every detail. He had the art of the masters, who can represent complicated things with apparent simplicity while still retaining their essence. An attention to detail he also brought to the title of his paintings, mixing humor, word-play and puns (Birch Bark & Birds, Serengeti spaghetti, Upside Downside, Frog Eat Frog, Survival Savvy…). I also remember his people-alike illustrations (retro style), and before his death, he began painting apocalyptic scenes about global warming. 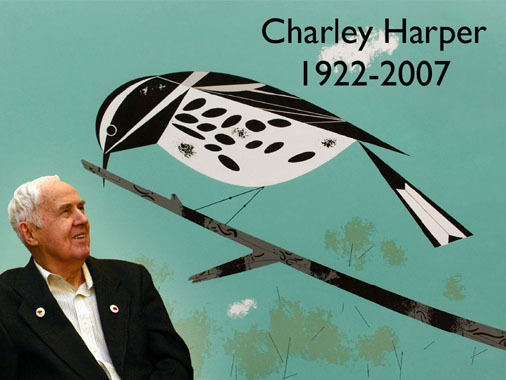 The Mayor of the City of Cincinnati proclaimed Friday, December 8, 2006 as Charley Harper Day in Cincinnati. Charley Harper died, June 10th 2007, in Cincinnati, Ohio. He was 84. A memorial exhibition (Aug. 18 through Oct. 21) at the Cincinnati Art Museum untitled: ‘Minimal Realism: Charley and Edie Harper, 1940–1960’, is dedicated to the life and work of Charley Harper and his beloved wife of fifty years, Edie. If you don’t have the opportunity to see this exhibition (hurry if you live near Cincinnati, it may be already too late as you read this post), AMMO Books edited in August, in collaboration with designer Todd Oldham, a 420-pages book: ‘Charley Harper – An Illustrated Life’ (standard book and luxurious limited edition), which is the definitive book on the artist. It costs $150 (standard book edition on Amazon) but it is really worth the price (or buy the $10 Charley Harper 2008 Diary: Small Magneto as an introduction to his work).